Plot: A suit-wearing, briefcase-carrying baby pairs up with his 7-year old brother to stop the dastardly plot of the CEO of Puppy Co. Starring: Alec Baldwin, Steve Buscemi, Jimmy Kimmel, Lisa Kudrow. 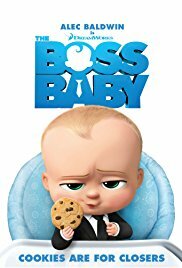 distributed by Fox «The Boss Baby» in the US movie theaters released on March 31, 2017 and has grossed over $528 million worldwide; dvd and blu-ray release date was set for July 25, 2017. Rent from Netflix and Redbox from August 1, 2017. «The Boss Baby» in the UK released in movie theaters on April 1, 2017. The movie released on dvd and blu-ray on July 31, 2017.